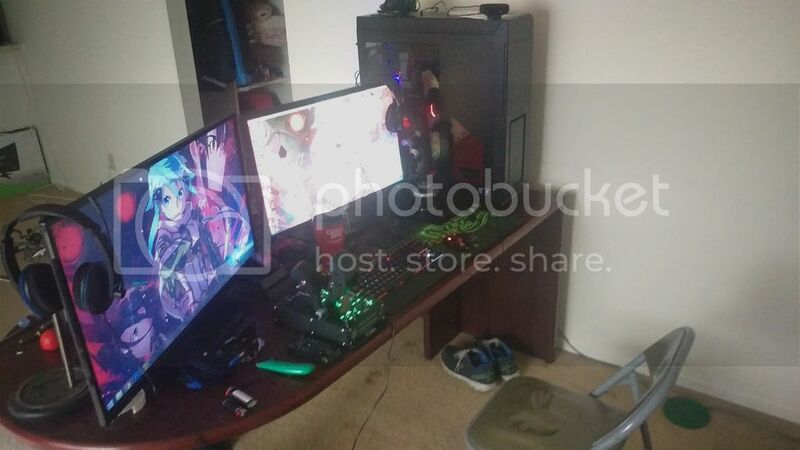 Post your Gaming Rigs/Gaming Space! Discussion in 'Off Topic' started by SeymourGore, Mar 9, 2011. Might sound dumb, but you sure they're in the right ports? And did you already run the audio wizard? Check your motherboard manufacture's website, they might have audio drivers there. k e v i n likes this. Try your headset on another computer? Might be broken? I recommend installing a linux distribution, there I could actually help you. Bios flash might change the audio bus problem but I think your MB is pretty new ... so I dunno if it will fix it. `InsTanTacTioN.#, Bestking, Dimitryy and 2 others like this. PS : Doesnt that chair hurt your back in some way? Bestking and Dino like this. Finally have the new gaming space pic worthy. Still need to clean up the cabling and put some pictures on those bare white walls. I've got a Tribes 2 poster that I want to frame and mount. Got rid of the old triple monitor setup, didn't have a need for the extra monitors, nor the power to game on triple monitors. My personal PC has received a couple of upgrades: upgraded to a FX 8320 and a H80i to cool it down, and a Radeon 380 4GB. 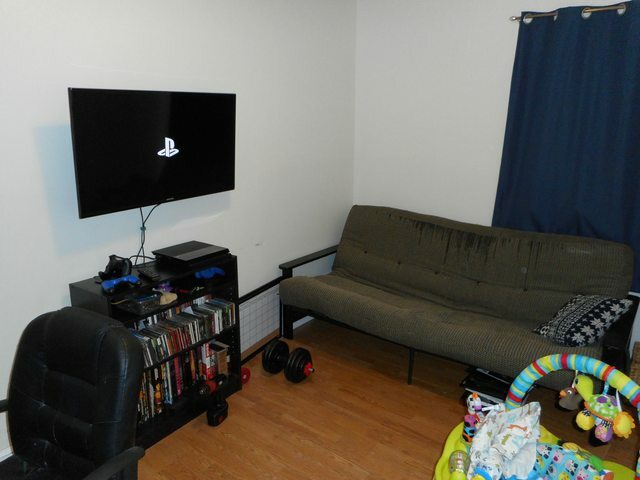 The Samsung HDTV you see in the picture is mounted to a swivel wall mount, there's a futon on the other side of the room where I can lounge and lazily play some PS4, or rotate it so I can play from my desk chair. There's currently only the PS4 hooked up to the TV, planning on running a cable from my PC to the TV, so I can play Arkham Knight or other gamepad friendly game on it. Planning on picking up an AV rack at some point and replacing the bookshelf with it. The bookshelf would then be tucked into the other corner of the room beside the futon. Also check out Baby Gore's decked out Exer-saucer. That aftermarket turtle accessory has a tummy mirror and rattles. Bestking, PureWhoopAss, loc and 5 others like this. Finally have the new gaming space pic worthy. Are we just going to ignore the massive dumbbell on the floor? Clearly Seymour is getting shredded up at the North Pole! k e v i n and TylerMarket like this. Maybe you can finally come play pugs Seymour! No way, I'd get yelled at for doing something wrong! Bestking, tree and WildFire like this. Nothing you do is EVER wrong Seymour. We love you to much to yell at you.